Today is a momentous day in Egypt. A year to the day since Morsi was elected, and hundreds of thousands are back in Tahrir Square to demonstrate against what many see as his failed presidency and to ask him to leave. Irhal (leave) they are shouting or mish 3ayzinaq (we don’t need you)! Well, I wish I could have been in Cairo now despite the heat instead of a few weeks ago. Would be quite fascinating. 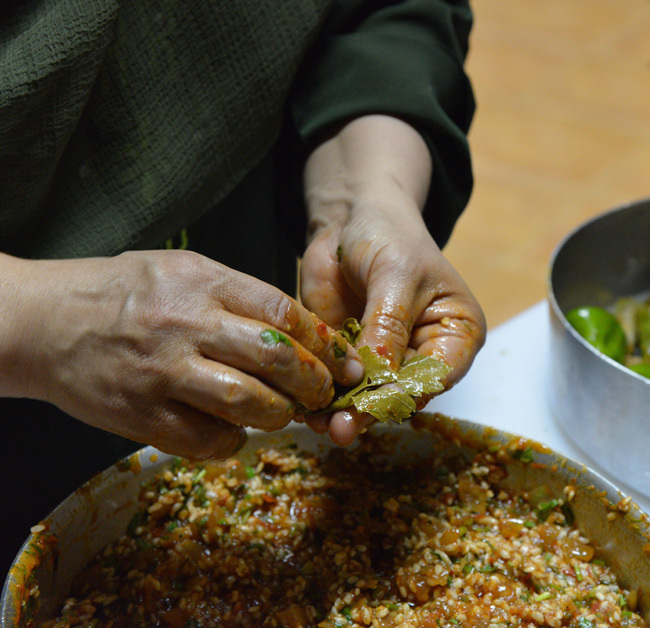 Still, it was pretty wonderful then, especially the evening we spent watching Magda cook a few dishes, including mumbar (stuffed ox intestines) and mehshi waraq 3enab (stuffed vine leaves) before feasting on them. We have both dishes in Lebanon but the Egyptian versions are quite different. For one, we use sheep’s intestines for fawaregh (our name for stuffed intestines) whereas Egyptians use the much bigger and easier to stuff ox intestines. Magda did hers in no time whereas my mother spends hours turning over the intestines and filling them with a rice filling that also has minced meat and chickpeas whereas the Egyptian stuffing is vegetarian with no chickpeas. The other thing that surprised me was how Magda never sewed the ends of the intestines, and instead dropped them as is in the boiling water where they immediately seize up with the ends closing naturally. She also cooked them for a much shorter time, less than half an hour, then fried them in oil. Totally different from our method where we cook them with stuffed tripe and for a lot longer; and we never fry them. 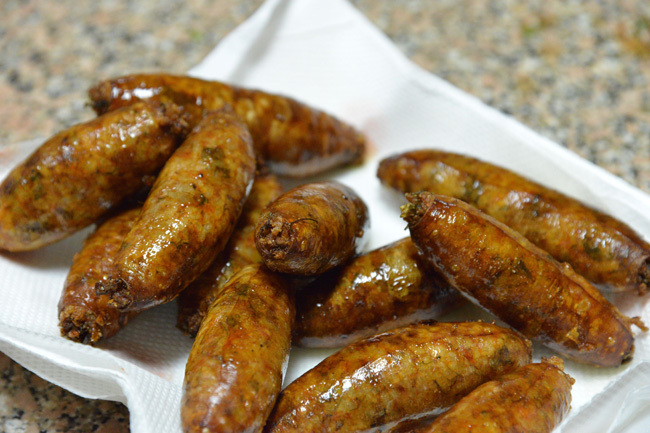 Hers end up looking like regular sausages whereas ours still look like intestines, or at least if you don’t like offal, not as appetising as those in the picture below. 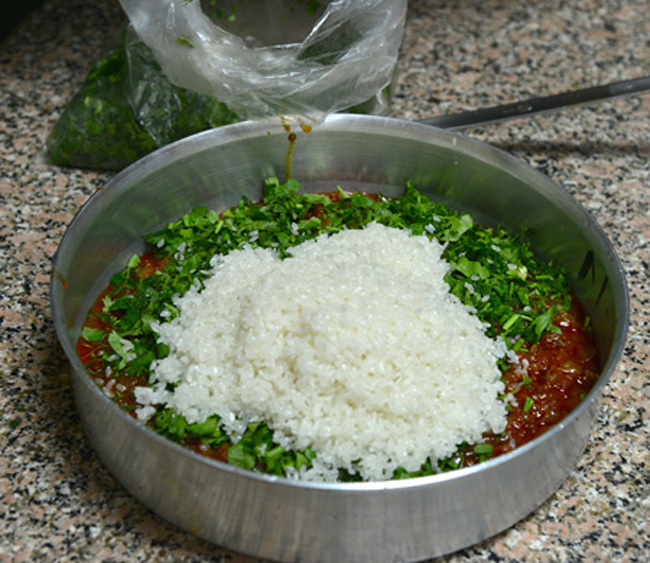 Next time I go to Beirut, I will chronicle the making of fawaregh and will try to make them look pretty! 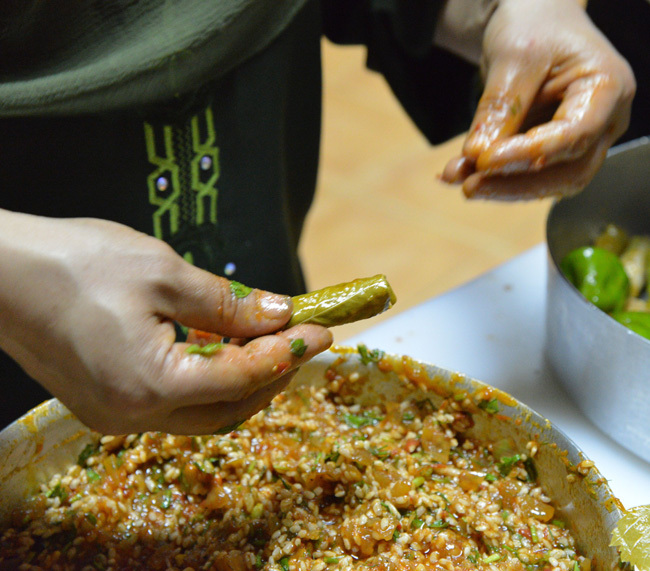 When she finished stuffing the intestines and put them to boil, she moved to making stuffed vine leaves, also using a vegetarian stuffing with the same rice, herbs and onion mixture but using a cooked tomato sauce instead of the liquidised fresh tomatoes she had used in the intestines stuffing. I was in Cairo during fresh vine leaves season and I have to say it makes all the difference to use them instead of those vacuum packed or those preserved in brine. The vacuum packed are marginally better but both are no match to the fresh ones. 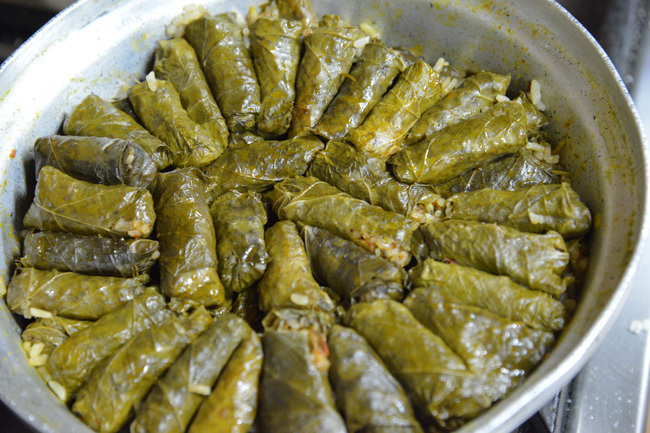 In Lebanon, most cooks would use the fresh vine leaves as is but Magda blanches hers first, saying it makes rolling them easier which is true although it is not so difficult rolling them completely fresh if they are young and tender. 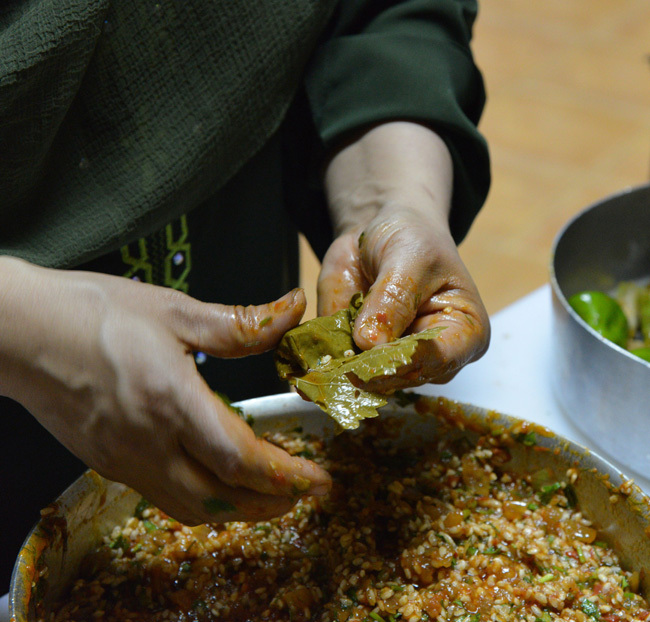 Whereas it would have taken me at least an hour to roll the same amount of vine leaves, she again did hers in no time. I should follow her example and cook every day. 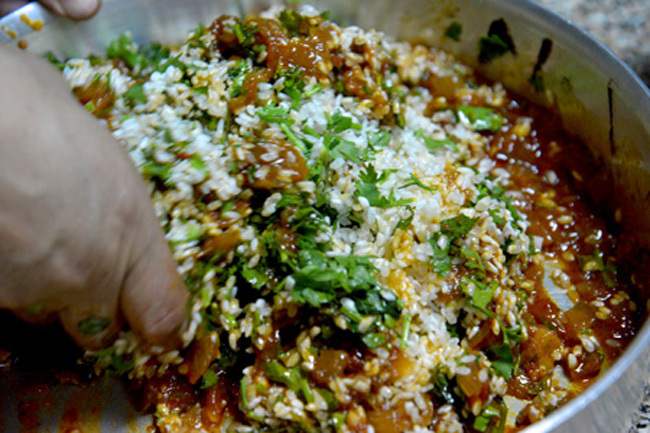 Then, I will become very quick at all the complicated Arab dishes. Anyway, for those of you who have a vine growing in their garden, it may still be time to pick a few fresh vine leaves. Do it as using them in season is so much better. I have a friend in Beirut who freezes enough every year to last her until the following season and they are the closest to the fresh ones. 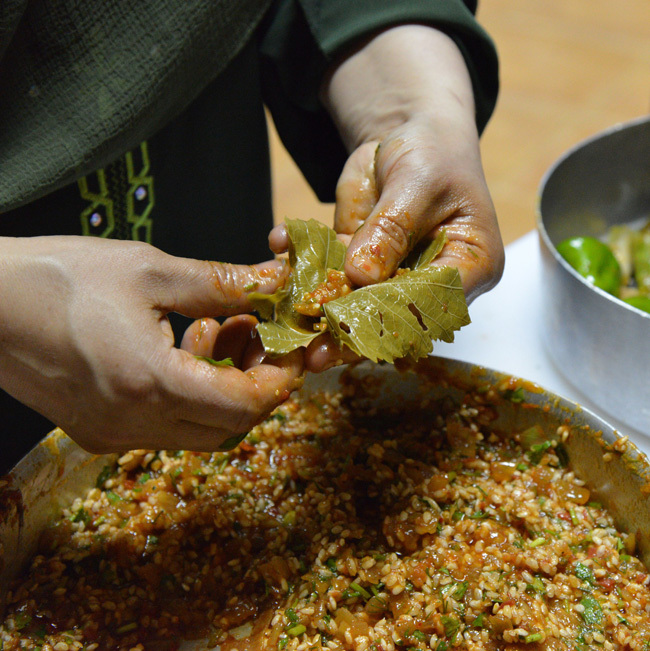 In the following pictures you see how Magda rolls her vine leaves very neatly. And here is the finished pot with the vine leaves cooked and ready to be served. I had quite a few that evening. Almost impossible to stop. 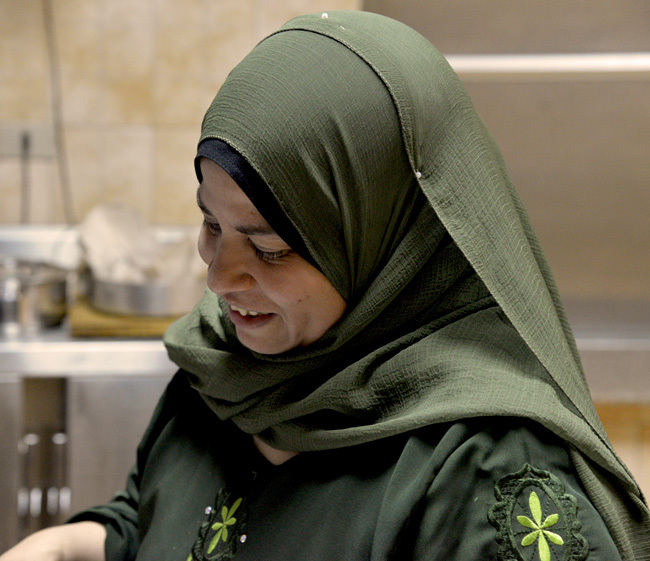 Not so long ago, Mohamed at al Waha served the best stuffed vine leaves in London. His were Syrian with quite a heady mix of spices as well as pomegranate syrup whereas the Lebanese version is straightforward lemony with both sumac and lemon juice in the seasoning. The Egyptian version is in between. A little more complex than the Lebanese but not as elaborate as the Syrian. Sadly the chefs at al Waha changed the recipe and they no longer serve the sweet savoury version. Theirs are still better than anywhere else but not as irresistible as before. Still, if you don’t have the patience to make your own, I suggest you go there. 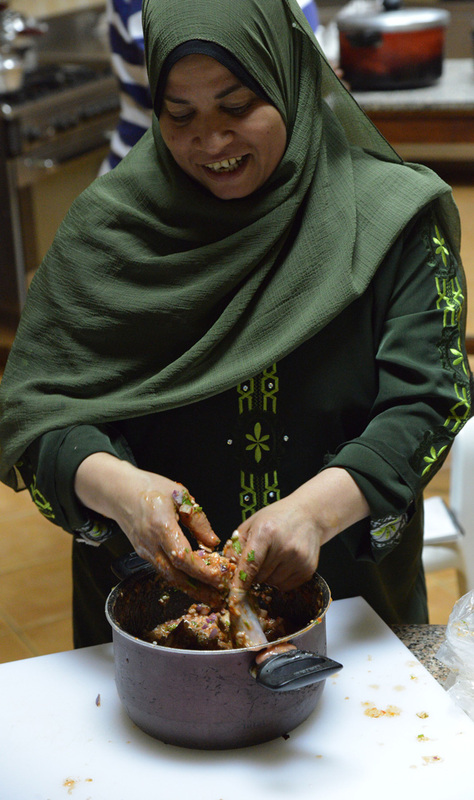 As for me, I will definitely ask Magda to make me some more when I return to Cairo. fabulous mouthwatering post…havent had stuffed grape leaves in years because I too am spoiled and insist on fresh young tender leaves that when cooked are silky and almost melt in your mouth..preserved leaves never are good to me!..a long time ago I bought some flash frozen fresh ones from Eygpt that were great but the middle eastern grocer in my area stopped bringing them.Magdas handiwork looks delicious..